Click here to view the Reading Group Guide, Potato Peel Pie Recipe and much more for your book clubs! 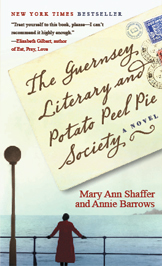 Join the Random House Readers Circle mailing list and receive the latest news about Guernsey! Virtual book club, next question! While we’re thinking about it, let’s talk about literary tourism! Would you ever take a trip to Guernsey? Or anywhere else inspired by a book? What literary tourism have you participated in? Where do you dream of visiting? Check out this great article from the Boston Globe–written by a reader who fell in love with the island through the book and decided to take the trip! The video is a must-see as well, for a glimpse of the island as it is today, and to hear its story from a few of its longtime residents, some of whom lived through the occupation themselves. News story about our Guernsey trip!